A holiday classic by the author of Danny and the Dinosaur, available again—and now with full-color art! Milton the moose wants to help pull Santa’s sleigh. “I have never used a moose before,” says Santa, “but I’m willing if you are.” At first, clumsy Milton is not very good at landing on roofs. But when Santa’s sleigh becomes too heavy for the tired reindeer, Milton comes to the rescue. This reissued edition is a funny holiday twist on Santa and his reindeer by Syd Hoff, celebrated author of Danny and the Dinosaur. 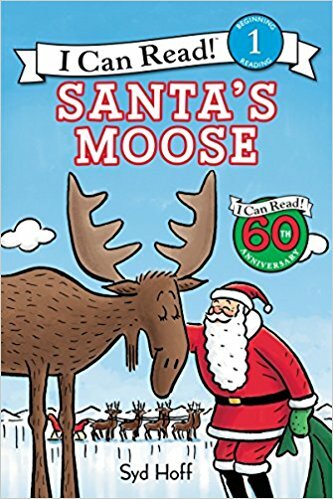 Santa’s Moose is a Level One I Can Read book, which means it’s perfect for children learning to sound out words and sentences. About the Author: Syd Hoff was a much-loved and much-read author and illustrator of numerous books for children, most notably the Danny and the Dinosaur titles and Sammy the Seal. Born and raised in New York City, he studied at the National Academy of Design and sold his first cartoon to The New Yorker when he was eighteen. His cartoons became regular features in many magazines and newspapers. Sid Hoff was born in 1912 and died in 2004, at ninety-one. His books continue to delight readers worldwide.